At last, with so many rumors, the UPTET 2017 Examination has been successfully executed in all 75 districts of the STATE of Uttar Pradesh on 15 October 2017. This time (October 2017 UPTET), approximately 9.76 Lakh candidates has appeared in the Examination and now are waiting for the positive UPTET result to get released at UPTET Official Website. To get a rough estimate about your chances to crack UPTET 2017 Examination, you can anytime check the offcial UPTET 2017 Answer Keys / Sheet at UPBEB (Uttar Pradesh Basic Education Board) official website. Due to the commitment made by the Uttar Pradesh Government to release the UP Primary Teachers Recruitment 2017 NOTIFICATION in December 2017, the official UPTET 2017 result is likely to get released in the last week of November 2017. 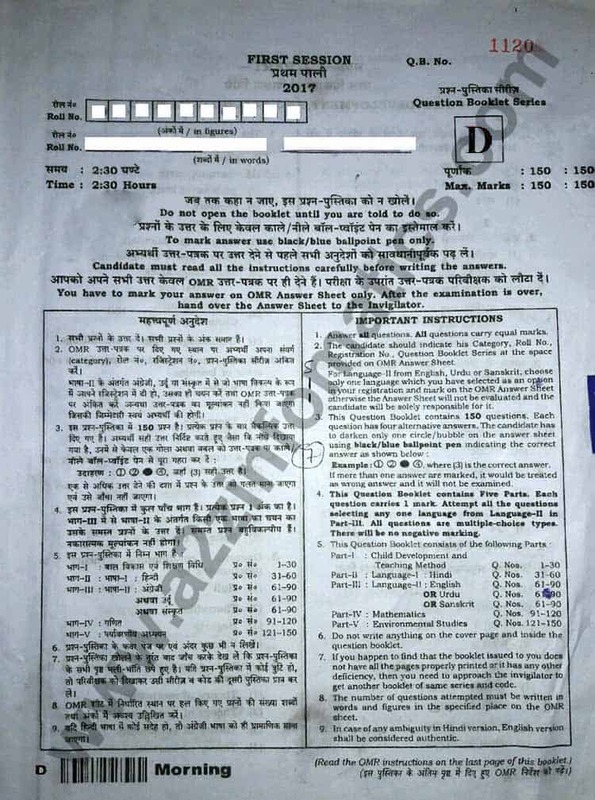 Some reputed sources had already confirmed that the official UPTET 2017 result date is 30 November 2017. For any future reference or need, today we are here with the solved original UPTET 15 October 2017 Primary level (Paper 1) Question Paper (Booklet Series D / SET D) with complete answer keys / solutions / answer sheets. Download UPTET 2017 PRI Solved Question Paper-1 Class 1 to 5 (Primary Level) SET D in Hindi / English. Download UPTET 2017 PRI Question Paper-1. Important Stats about UPTET 15 October 2017 Examination. Total UPTET 15 October 2017 Applicants: 10,09,347. Total Rejected Applicants by the UPTET Exam Authority: 32,587. Total Candidates Appeared in the UPTET 2017 Exam: 9,76,760. Total UPTET 2017 Primary Level (Paper-1) Candidates: 3,49,192. Total UPTET 2017 Upper Primary Level (Paper-2) Candidates: 6,27,568. UP TET 2017 Official Answer Key Release Date: 18 October 2017 (12 Pm). UPTET 15 October 2017 Result Date: 30 November 2017. Candidates preparing for the different competition examinations or other state TET (teacher eligibility test), who knows if any of the question listed here in the UPTET 2017 primary level question paper 1 gets repeated in any other competition exam. Organisations / Institutes engaged in the UPTET Preparation Education or other competition exams. Students willing to attempt the UPTET Examination in the coming years. These UPTET previous years question papers are actually very essential element of their UPTET Exam Preparation / Study Material. Download Official UPTET 15-October 2017 PRI Question Paper-1 SET-D (Primary Level, class 1 to 5) with Answer Keys / Solutions in Hindi & English. UPTET 15 October 2017 Question Paper include of total 30 pages, the official UPTET 2017 question paper has been divided into 5 Sections which have been explained in the next section of this post. Read all the important instructions very carefully, prior to attempt the Uttar Pradesh Teacher Eligibility Test Examination. Sections of the UPTET 2017 Primary Level (Paper-1, class 1-5) Examination. Section 1: Child Development and Teaching Method / बाल विकास एवं शिक्षण विधि. (30 Marks). Section 2: Language – 1 (Hindi) / भाषा – 1 (हिन्दी). (30 Marks). Section 3 (A): Language – 2 (English) / भाषा – 2 (अंग्रेजी). (30 Marks). Section 3 (B): Language – 2 (Urdu) / भाषा – 2 (उर्दू). (30 Marks). Section 3 (C): Language – 2 (Sanskrit) / भाषा – 2 (संस्कृत). (30 Marks). Section 4: Mathematics / गणित. (30 Marks). Section 5: Environmental Studies / पर्यावरर्णीय अध्ययन. (30 Marks). Download UPTET 2017 UPRI Question Paper-2 SET B (Upper Primary Level, class 6-8) with Answer Keys / Solutions. Download UPTET 2017 Upper Primary (class 6 to 8, Paper-2) in hindi / PDF format. Download UPTET 2017 PRI (Paper-1, Primary Level, class 1-5) Question Paper / Booklet Series D.
Important: The UPTET 2017 Official / Original Question Paper (PRI-2017) consist of 30 pages, link to all 30 pages is given at bottom of this post. You are now at page number 1 of UPTET 2017 Primary Level (PRI, Paper-1, Class 1 to 5) Solved Question Paper SET-D in Hindi / English, don’t forget to visit other pages (links given at bottom of this post) to download UPTET 2017 PRI Paper-1 in PDF format. The UPTET 2017 PRI (Paper-1, Class 1 to 5) exam was held on 15 October 2017 in the First Meeting (10:00 Am – 12:30 Pm). Note: Use Right Click (on PC) or Long Press (on Mobile / Tablet) > Save Image as > Save option to download UPTET 2017 Primary Level Question Paper 1 (PRI, Class 1 to 5).